Doctors performed a five hour operation to remove the growth and part of Wood’s lung but luckily, the musician is “OK now,” he told the outlet. Following the surgery, Wood said in a statement he was grateful to doctors for finding the growth early. He’ll continue to get checked every three months and encouraged others to do the same. ″People have to get checked. Seriously have to get checked,” he said. Wood, who became a father to twins in 2016, admitted he wasn’t totally surprised by the diagnosis. 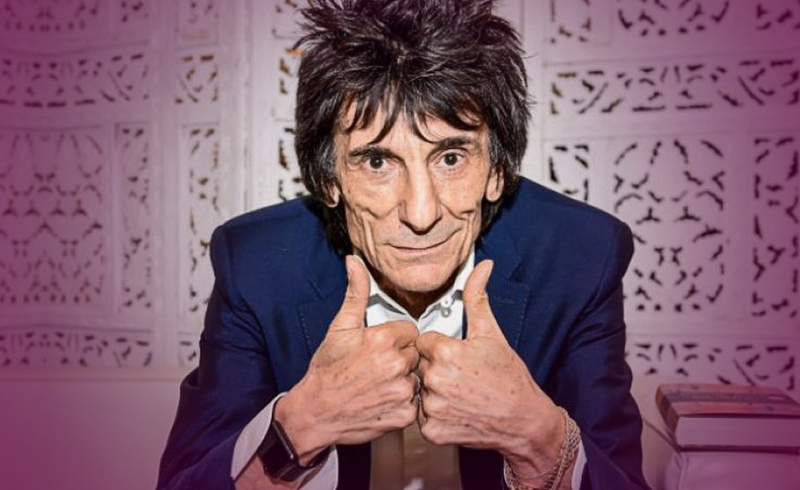 The musician noted that he’d wondered about the state of his health in the past, especially because of his “50 years of chain-smoking ― and all the rest of my bad habits.” When his doctor asked if Wood wanted a more thorough check at his heart and lungs, the rocker encouraged it. “And then he came back with the news that I had this supernova burning away on my left lung,” he said. “And, to be totally honest, I wasn’t surprised. I knew I hadn’t had a chest X-ray since I went into Cottonwood [a rehab clinic in Tucson, Arizona] in 2002. He asked me what I wanted to do and my answer was simple: ‘Just get it out of me.’” Wood credited his wife, Sally Humphreys, with being a solid support system throughout the whole process. The two kept the diagnosis to themselves, Wood said, because they “didn’t want to put anyone else though the hell we were going through.” He also revealed that, if the cancer had spread beyond his lungs, he wouldn’t have gone through chemo. It wasn’t because he thought chemo wouldn’t work, it was because “this hair wasn’t going anywhere,” he said. After the interview was published, Wood thanked fans for the support on Twitter. # “I’m feeling great and ready to see you on the road next month,” he wrote. Always Wonderful To Write A Happy Ending From A Cancer Diagnosis! Go Ronnie!!!!! I certainly have to agree with Ron’s own conclusion as to why he is alive at all…a strong guardian angel. I am sure with all the hard road partying and smoking for 50 years; his guardian angel had to put in a lot of overtime hours. Lol! This is a new passionate lease on life and can also mean birth of a child. I feel this card represents how Wood feels about his life in both areas. This is disappointment and leaving an unhappy situation. Since pulled inverted, this card definitely shows a hopeful and happy outcome to this life challenge. This is a woman where status is important, very nurturing and wants to be of service. I believe this card represents Wood’s wife Sally, as he stated she was his solid support system through his health challenge.